I thought I would offer up some of my experience with my recent exhaust change. I got lucky and found a not hurt too bad Corsa system on Craigslist for $450. Some cleaning/polishing/paint, and it was good enough to hang under my car. 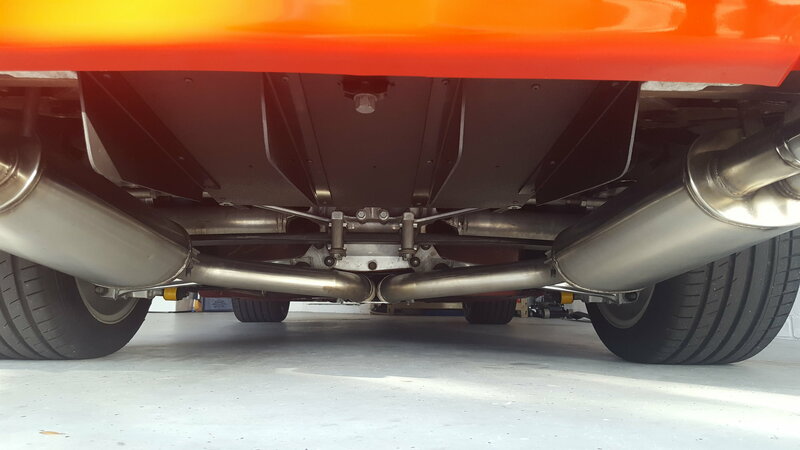 The only part that you can really see (the offset pieces from the H pipe to the mufflers) really shined up well. Every one says Corsa doesn't drone. Strange, because mine does. Not bad, and not all the time, but at any speed up to 90 mph (as fast as I got so far) in overdrive/6th...it drones. Easy fix. Don't use overdrive/6th. Also, if you're tooling along in 4th or 5th and the motor lugs down, like going up a hill, if you don't downshift...it drones. Again, it's not horrible and easy fix with that 3rd pedal. All of that being said, I love the sound. It's not what I would call loud or obnoxious at all. Even my wife, who hates riding in any loud vehicle, says this sounds fine. Though she does complain that I same to be running thru the gears a little harder than usual just to listen to the exhaust note. Would I have paid $1500 for a new Corsa catback? I don't know. Before I ran across this used set, I had been waffling back and forth over it. I love the sound and I'm happy with what I have, but I think Corsa (really all of the aftermarket exhaust makers) are overpriced. Yes, I get that there is development/marketing/manufacturing dollars involved in putting out such a product, and it is a very well made set up. Extremely well made. But $1500. 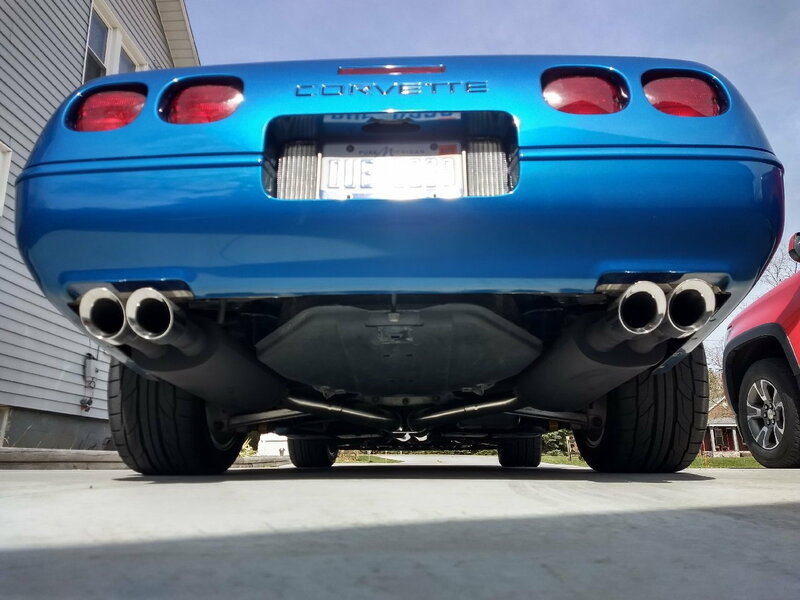 When I was first thinking about a new exhaust, I started paying attention to the mufflers on every C4 I saw. And I saw a lot. Car shows, Corvette shows, and just on the street...there are a lot of C4's around Flint Michigan. I was at the Corvette Reunion at Back to the Bricks and the Corvettes America show in Clarkston. Not a single one had a Corsa system. Saw a few Magnaflows, and a bunch of who knows whats, but nothing from the premium vendors. That right there should tell these builders that very few C4 owners are willing/able to spend the bread they're asking for their systems. Maybe the cost to build these systems is higher than it seems like it should be. But, I think if Corsa was selling these exhausts for $900 or $1000, you would hear them all over town. Maybe they can't. Maybe they just won't. I don't know. Did I mention I really love the exhaust? Looks like you have a LT1 so may differ from the Corsa for a L98, as the Corsa on my '88 has zero drone at any speed. I have them on my '95. I do not notice any drone with mine. To me they seem very quiet (compared to my "normal" loud exhausts). Although they seem to be much louder outside the car than inside. For sound, I have had stock, Corsa, Borla L98, Borla LT1, and muffler eliminators on my C4's. At idle my favorite is the muffler eliminators that have a really deep musclecar sound, while driving I liked the Borla L98 with a deeper tone and a great sound. These L98 Borla were an old system with the "intercooled tips" that came out in 1985 (on my '85) The newer Borla L98 sounds good at idle on a friend's car, but I have not heard it when driving the car. I looked at a lot of exhausts also. I like the looks of the Corsa the best. They seem to be well made. The performance is fine (although I don't think there is really much gain over a stock LT1 system). For looks, I do not like the LT1 Borla. They seem to have two exhaust pipes with a rectangular can around them. It just looks cheap to me. I also do not like the Magnaflow because the muffler body hangs down too low below the body line. The new Borla L98 has an oval tip that I think looks pretty good. I agree they are overpriced. I would not buy them for $1500 because I am cheap. But I found a used catback system a few years ago and glad I picked them up. Glad you love the Corsa and they look great on your car. I like mine too. My '94 ragtop six-speed LT1 car came to me with a 3" B&B system on it. It droned so badly that I just couldn't stand it. After putting up with it for far too long, I yanked it off, and bolted a Corsa system in its place. Difference is night and day. Zero drone with the Corsa on my car. I should have made the swap years before I did. Thanks for sharing. to me, the Corsa is the best looking out there for these cars. Not sure I'm in love with the sound of them at idle, but judging from sound clips I've heard, they sound amazing during acceleration. I'm not surprised to hear that they drone, even the stock exhaust can drone on these Lt1's. I agree, new, they are far too expensive, especially given what C4's cost, lol. I've recently seen them as low as $1100 recently, but I still can't quite pull the trigger on them. You should take a look at what they charge for newer vettes! Absolutely insane for what's basically mufflers, a resonator, and some SS tubing. How loud are they at cold start-up? I notice even the stock mufflers are a bit noisy when the car is fired up after sitting overnight. Of course, they quite down real quick once the idle drops, but still a concern of mine, as I sometimes commute in the C4, and leave around 3:30am. I'd hate to annoy everyone around me with an obnoxious exhaust. If the product is well made and durable, why would it be cheap? If a person of your skill level is worth $20 an hour, would you take $15 or hold out for $20? Short of your being desperate, that is. The stock system on my LT1 never even hinted of drone. Gas on, cold/hot, nothing but quiet. Too quiet for a performance car. I have a theory that a convertible (with top up and windows rolled up) will drone less than a regular coupe with windows rolled up, with the same custom exhaust. The reason is due to the rear glass "Hollywood Bowl Shaped" clam shell hatch. A soft convertible top won't amplify the sounds rising up from the custom exhaust under the car as much as a hard top with lots of glass. 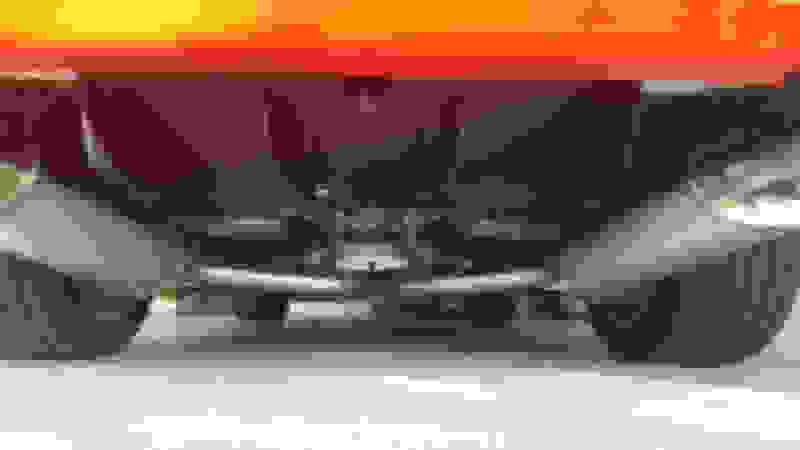 Last edited by RetroGuy; 04-14-2019 at 08:12 PM. C4's have been around for a while now. So have Corsa exhausts built for them. From reading just this forum, it sure seems like lots of C4 owners would like to have a Corsa system on their ride. What's stopping them? As I indicated in my original post, I don't know what it costs Corsa to build one of these systems, but certainly there is some reason they are missing out on most of their would be customers. It has nothing to do with cheap. It has to do with being able to move your product. No doubt my sample is somewhat small. But to find none/zero/nada, says something. Again, I don't know if their profits are too high, or maybe their costs are. But either way, they are missing out on a lot of sales. And apparently have been for many years. I am reminded of a long dead uncle, who owned and operated the gas station/garage I hung out/worked at as a teen. His gas and wrenching prices were always the highest in town. My dad once asked him why his prices for gas were so high. Uncle said he'd rather pump 200 gallons a day to make his profit than he would 1000. My dad said, yeah, but look at all the customers you're chasing away. Uncle Bill said, that's ok. At these prices I don't need very many. You are fine with your car's noise. The neighbor might not. I'm fine one night if you fire up the chainsaw but day in, day out? Probably be working on trying to get a noise ordnance in place. This is why a neighboring town had that ordnance in place. When I brought my HD in for dyno tuning, they had me sign a waiver or they won't road test it after tuning since it had ANY aftermarket muffler. I've also known a guy who decided to charge more than he was and call himself a specialist. If he didn't die, the business would probably be going since people thought he was "more better" than he was. I suspect that it has much to do with the business model as to whether you can and want to be a "man of the people" or make yourself an "exclusive" club where people wish to be in there. Every one says Corsa doesn't drone. Strange, because mine does. Interesting that your Corsa drones. I love the Corsa on my ZR-1 since it never drones. I've heard that drone might be caused by the distance the exhaust extends beyond the bumper (it should extend some IIRC). I can't tell from the angle, but do the tips stick out a little from the bumper? Could the cat affect the harmonics? I know I had to put a cat on my Borla because the noise got out of hand. I have thought of going with the LT1 system but didn't want to hurt the flow so I put up with the Borla. Although, I do suspect that if I had stock exhaust manifolds with the pre-cats it might change some of the noise. Louder probably makes them think it is powerful because that is how it had to be back then and they haven't been able to learn new things. Are you sure that is a Corsa and not an OBX? Does it have "Corsa" embossed or laser etched in the tips? I've never seen a C4 Corsa system with seams right here, but I have been wrong before!